There are different theme/plants Kokedama workshop. It will be friendly, fun atmosphere, therapeutic, mindfulness experience through making Kokeama. You will learn the skills behind Kokedama include how to make your kokedama and how to take care of Kokedama. Led by Kanako Yamada, owner of Kodama Forest, participants receive questions and answers from an expert and all the supplies needed to make your own unique Kokedama! Theme/plants selection will be different in each class but the fee includes: plants, moss, soils, and all material need to create your own Kokedama. Enjoy a unique, fun-to-make Kokedama which gives people a peaceful and tranquil mind! Keep for yourself or give as a wonderful living gift. Please bring an apron or cover-up and glove too if you like. Enjoy the beautiful Japanese garden with Kokedama making! All the material will be brought by instructor at site, material will not be ship out to your address. Cancelation policy, Full refund by 5days before of the workshop. Half amount refund before 4 days to the day of the workshop. For additional guest (age above 6) who does not participate workshop but come along with participant need admission, please purchase "additional permission" for the number of the non-workshop participants. Becoming a member of Japanese Friendship Garden has lots of benefits! To be a member, visit JFG website. 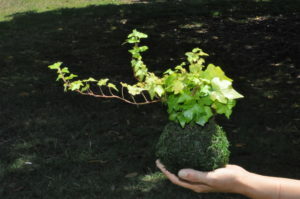 Hope to see many people at my kokedama workshop and enjoy the garden together. Just Walk In, it's a free tuesday, free admission to Japanese Garden and come join us to make your own unique planet like sphere kokedama. 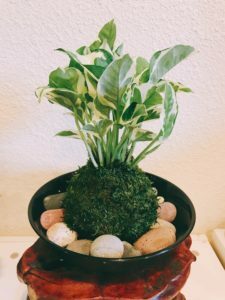 $15 ~ for making one house plant kokedama! You can chose a plant from below selection if you reserve by 2/27. If you don’t know which to pick you can just pick from the plants I selected for you. You can request me individually if other plants you like to try making it. Price may vary depend on the plants but I will accommodate your request as much as I could. Call me or send me E-mail for your specific request. Please indicate about Kokedama class. Thank you! Kokedama is a traditional Japanese Living Art form where moss is used as a container for a plant. In this interesting and hands-on workshop, we will make two house plant Kokedama! You will learn the skills behind Kokedama and how to make your very own. Fee includes all of the supplies to make two house plant Kokedama, including plants, moss, soils, etc. This is a unique, fun-to-make Kokedama workshop that you can take home and enjoy, or give as a wonderful living gift. Instructor: Kodama Forest. Cost: Members $43, non-members $48. Fee includes materials. Succulents Moss Basket! 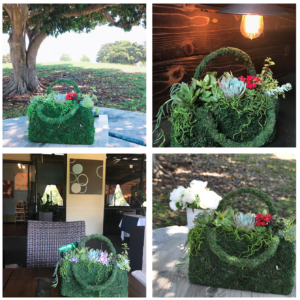 Design your own beautiful moss basket for house decor! Come and join to create your own beautiful succulents moss purse, fun evening for exploring your creativity, imagination and relaxation. 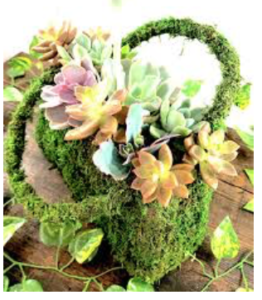 During this workshop, we will be creating a mossy purse filled with assorted succulents, it will be a cute home décor gift! You’ll be instructed to make your one of a kind house decor. No experience is required for this class. You can enjoy wine from Gianni Buonomo while you are attending this workshop! Variety of selection is offered from this urban winery or a boutique winery! Ticket sales ends on 4/5/2019. Event will be cancel if attendees are less than 5 people, your paid ticket will be refunded full. Click here to see Kokedama Workshop Calendar!